We all loved plasticine as kids, modelling clay which never dried out. You could mix the different colours, stamp shapes out, roll it into balls and shapes and… make album sleeves out of it! 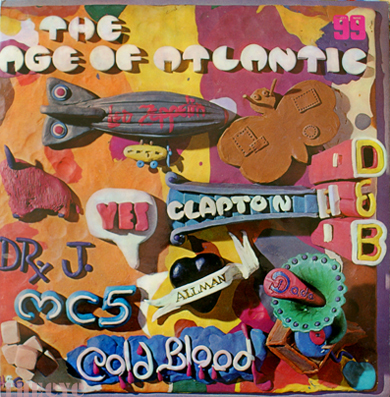 The Age of Atlantic is one of those sleeves which remains instantly memorable, even after forty years. Back in the 70s record labels didn’t like to ‘give away’ or devalue their product by shoving it out cheap just a few months after it had come out at full price. Music was seen to have a value and this was maintained to the benefit of shop, labels and artists; it made albums both aspirational and desirable. But labels also realised the value of introducing their repertoire to new buyers, and the low-cost sampler album was a very popular way of doing this. You Can All Join In, The Rock Machine Turns You On, Bumpers and others fondly remembered by older music fans all gave younger kids a way of starting an album collection. Polydor launched their 99 Ninety Nine label with ten titles (probably in early 1970), and followed up with a further ten in October 1970. It is generally thought that the label name came about as the albums were priced at 99p, but I have no confirmation of this. It was this second batch of 10 titles which included The Age Of Atlantic, the second of three similar collection (Atco Blockbusters came out in 1969 and The New Age Of Atlantic was to follow in 1971). The rest of the albums were single act titles. Featuring a great selection of progressive rock acts including Yes, Led Zeppelin, Iron Butterfly and others, put together by Janet Martin, The Age Of Atlantic was my first introduction to Neil Young via Buffalo Springfield, and I remember buying two or three albums later by bands I first heard here. But it was the cover which really stood out in the racks. It featured a flat slab of plasticine in numerous colours across the front and back. Onto this the designers moulded the names of the bands, with cut out shapes and little models of a Zeppelin and gramophone player. On the back, they inscribed the song credits into the plasticine with a nib, and added little plasticine picture frames for the catalogue number and logo. The album title was done in white circles of plasticine, each letter cut out of a different circle. 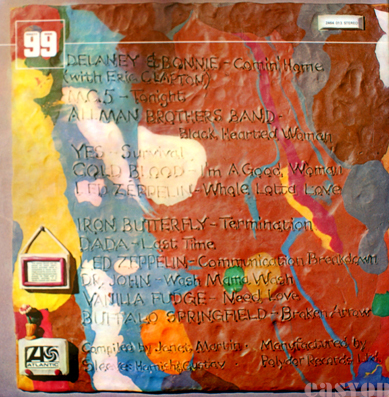 Unusually for a budget label, it was a gatefold (most of the 99 series were single sleeves). The designers realised they needed an image for the inner sleeve, so after they had photographed the finished cover, all the sculpted elements were removed, the scribed lettering was pressed flat and the background re-photographed. Over this, the sleeves of all the albums featured were added. The producers of thus piece of whimsy were Hamish & Gustav. Sadly I have been unable to find much about the pair, but they were quite active on album designs during the late sixties and early seventies, although nothing else I’ve seen by them comes close to this for playfulness. They worked a lot for Polydor and associated labels and 1970 was a busy year for them. 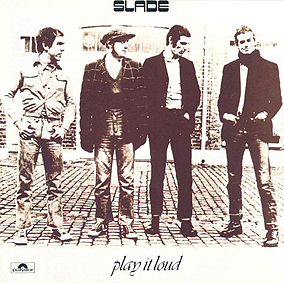 They did the early Polydor Slade album Play It Loud, sleeves for Tin Tin, Gass and Atomic Rooster’s Death Walks Behind You. In 1971 they designed sleeves for The Great Scots Sampler Volume 2 on Transatlantic and Nat King Cole’s Anatomy Of A Jam Session on the same label. The last album I can find them credited with is Aretha Franklin’s I Say A Little Prayer Album, also issued on the 99 imprint, in 1974. Most of the sleeves are well designed, simple, with neat typography and artist photographs, though they were also fond of vintage illustrations – Atomic Rooster had a William Blake illustration and the Scots Sampler had a reproduction of an old oil painting. 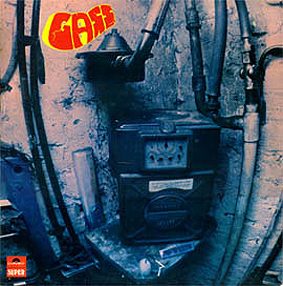 The band Gass is perhaps the best, with a great possibly infra-red image of an old cooking stove. It’s one of those ultra rare prog rock albums which would cost you an arm and a leg to buy. Mercifully The Age Of Atlantic is less rarified and you should be able to pick up a nice copy for a tenner or so. The lettering for the title does actually remind me of those alphabet sweets used for Island’s ‘Nice Enough To Eat’ sampler. Indeed, one of my favourites as well.